February 16 is National Almond Day. Just reading this news made me think of one of my favorite candy bars: Almond Joy. Almond Joy is a coconut filled candy bar with almonds on top -- all coated with milk chocolate. It was originally manufactured in 1948 by the the Peter Paul candy company. It replaced another candy made by this company called the Dream Bar. Peter Paul later merged with Cadbury before being purchased by Hershey's. Almond Joy bars are now made by Hershey's. You may remember the jingle from this commercial that mentions both Almond Joy and Mounds (similar candy bar with no almonds): "Sometimes you feel like a nut, sometimes you don't." This commercial ran in 1978, although the jingle was still popular into the 1980's. The jingle was written by composer Leon Carr, who wrote pop music like "Hey There Lonely Girl" as well as commercial tunes. Is this candy bar one of your favorites? Do you prefer Almond Joy or Mounds? Or do you have another almond-based candy that you enjoy? I hope you'll leave a comment, below. I love almond joys! Such a fun idea for a post! I have completely forgot about the "sometimes you feel like a nut sometimes you don't" commercials. If they had dark 70% cocoa I'd go back and eat them since I'm a major fan of coconut. My mom.loves almond joys, I'm allergic to coconut though so I can't have them. I did a post on national almond day too, great minds think a like! Both candy bars are still available for purchase. I prefer the Mounds as they are dark chocolate verses the milk chocolate of Almond Joy. Totally didn't realize this was a day! It's mine & my father's favorite candy.....now I have to go buy some! So cool! I'm a huge chocolate fan - not much chocolatey goodness that I won't try! Thanks for these little facts, I never knew! 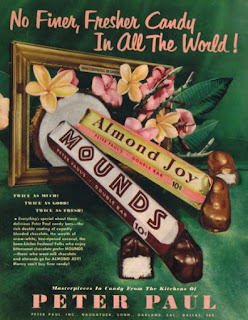 I love both Mounds and Almond Joy, but I wish they were much, much larger because I want more! For whatever reason, I used to not like almond joy even though I really like chocolate, coconut, and almonds separately. I have since seen the light! ;P I'm not sure I've ever had Mounds!